1987-2004 Mustang, MM Sport series damper package for IRS Mustang, includes 2 MM Sport struts and 2 MM Sport shocks. Intended for street-driven Mustangs with front coil-over spring rates of 350 lb/in to 400 lb/in and rear coil-over spring rates of 500 lb/in to 600 lb/in. Shocks do not include shock mount bushings because they are part of the coil-over conversion kit these shocks are intended to accompany. Can be used with high rate conventional springs: Expect good performance with compromised ride quality, and requires ordering lower shock mount bushings separately. MM struts do not come with dustcovers because these struts are intended for use with coil-overs, and the appropriate small dustcovers are included with our front coil-over kit. 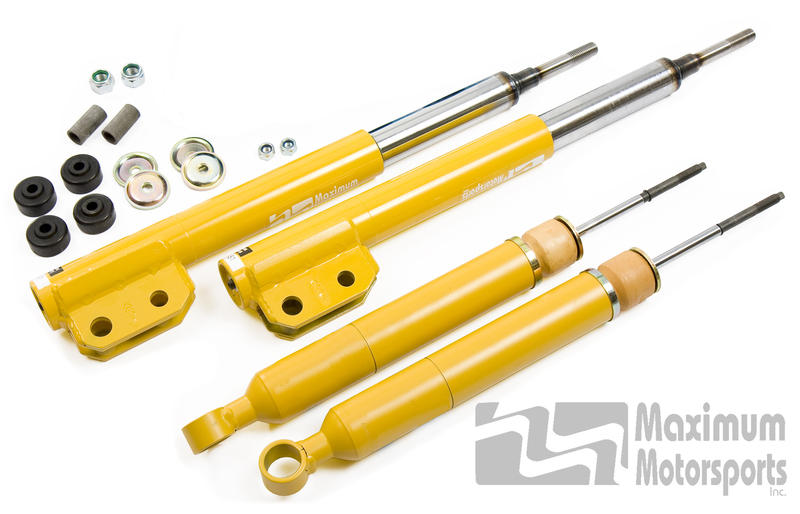 When used with conventional stock-location springs, the MM Sport series dampers provide excellent control. While ideal for track use, in street use there is an increase in ride harshness when driven on rough pavement. Offered exclusively by Maximum Motorsports for aggressive street driving, autocross, and open-tracking. The MM Sport series dampers are intended for street-driven Mustangs with spring rates higher than the rates compatible with Bilstein's HD series dampers. Constructed with the highest-grade materials and extreme attention to detail, Maximum Motorsports manufactures the finest dampers possible. All MM non-adjustable struts and shocks utilize patented mono-tube technology. Compared to twin-tube dampers, these provide better heat dissipation to keep the damper's oil cool, which decreases heat-induced damper fade. The highest nitrogen gas pressure available prevents oil foaming and fading. The inverted strut design allows for very large strut shaft bushings, which are less prone to deflection. This inverted strut design also keeps the oil seal protected from the elements. Every MM damper is tested on a shock dyno before leaving the factory to ensure quality. All MM struts feature unique proprietary strut housings with high-strength mounting ears. These mounting ears prevent the possibility of bending as a result of brake-torque reaction loads. All MM rear shocks come with an integral, progressive bumpstop. Warranty on MM struts is 3 years.